The penultimate episode before the series takes a break until Christmas, this story is set on Earth – the first to be set there for a while, and focuses on the Pond’s real life, and how the Doctor manages to fit in with it. The mystery of the small, black cubes that fell from the sky one day is a lighter episode from the previous one, and has a feel for the Russell T Davies era again. I must confess I wasn’t particularly interested in the cube storyline, although I did find them creepy enough – they way they had adapted slowly and silently into everyday, modern life seems like it could be a potential reality for the future. But this episode primarily focused on the Ponds. As it was based entirely on Earth, we start to see that they have in fact grown up from when we first met them in The Eleventh Hour –they now have each other, but jobs, commitments and lives to lead. I picked up on it other episodes but in the sequence when the Doctor lived in Amy and Rory’s home you definitely start to realise that the Doctor is like a big kid – he needs to be constantly occupied, shouting for Amy to witness him doing kick-me-up’s and playing on the Wii. But he genuinely cares for the Ponds’ we see this when he whisks them off to the past for his version of an anniversary present, and in the emotional and poignant scene between him and Amy at Tower of London. It was a beautifully written speech by Chris Chibnall and acted exquisitely by Karen Gillan and Matt Smith. It’s made all the more poignant because the line “You were the first face this face saw” can also relate to Matt and Karen themselves, as they both started their Doctor Who adventure together. It’s tender and one of the best moments in the episode. Brian is also back – hurrah! He was my favourite part of Dinosaurs on a Spaceship and he does have some comic moments in this (his cube video diaries are a treat) but the conversation he shares with the Doctor when he realises they’ve been gone for longer than a few hours is heavy, haunting and foreboding. “Not them, never them Brian” carries the level of importance these characters hold with the Doctor, and also perhaps gives a glimpse to the level of baggage that the Doctor carries-after all, this incarnation has yet to really lose anyone, whereas during David Tennant’s time his Doctor experience many a heartache. 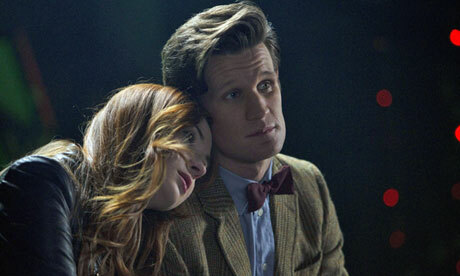 Could this change in the next and final episode of Amy Pond and Rory Williams. We march ever closer to the Ponds exit from the series and I’m looking forward to seeing the tear-jerker of an episode that Moffat has no doubt written.